This was my welcome to the world gift to Juliet. 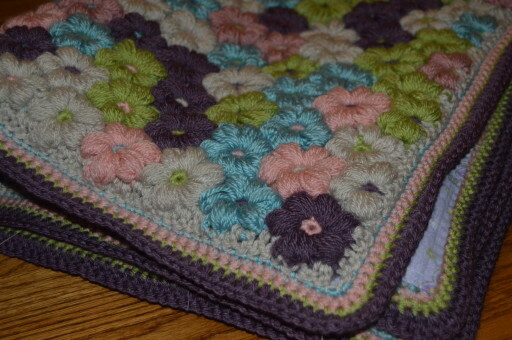 A blanket made up of a field of Mollie Flowers. When I shared the pattern before in my Mollie Flower Hair Clip post, I mentioned it I was making the flowers for larger project, well, here it is. 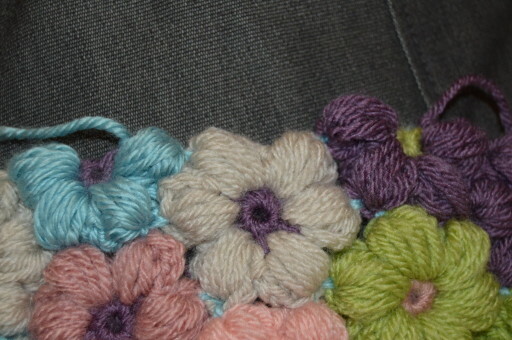 I first saw these crochet puff stitch flowers used as a throw pillow and absolutely loved them. I didn’t need floral throw pillows, but when I found out my sister was having a baby girl, I thought a flower blanket would be perfect. Here is the pattern from Roman Sock. The pattern gives step-by-step instructions for the flowers as well as how to join them. The flowers are just 6 puff stitches around a magic ring. 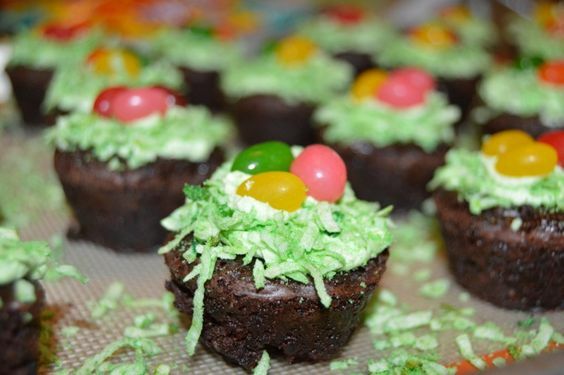 They aren’t complicated to make, but it did take some practice to get them them even. The ones I made at the beginning ended up being a slightly different size than the ones I made later, but it all worked out fine in the end. So my vision was a field of mollie flowers, in several colors, all randomly joined so there was no pattern. I started by picking one color and then went from there. I started with Vanna’s Choice in Dusty Pink and picked Dusty Purple, Sweet Pea, and Linen. I then decided I wanted to add a blue to the mix, and not finding anything I liked from Vanna, I chose Red Heart Soft in Sea Foam. I usually like Red Heart Soft over Vanna’s, but in this case, the softer yarn was harder to work with. It didn’t make as nice of puff stitches for the flowers. I originally bought just 1 skein of each color, but I needed 2. When I went back for more, I couldn’t find Dusty Pink, so I bought Pink instead. Since I was attaching the flowers in random order, I think it worked. With my 5 colors, I made 4 centers of each color, then made a flower in each color with each colored center, but I didn’t double up, so there isn’t pink on pink or purple on purple. This means there are 20 different flower color combinations. I wanted the blanket to be at least 30 inches square and each flower was just under 2 inches across, so I originally planned for 16 x 16 flowers, so I made 256 of them. Of course, this was bad math on my part. I didn’t take into account that in one direction the flowers are laid end to end, so 16 was the right number, but in the other direction, they nest a bit, so my 16 x 16 blanket was no where near square. it was closer to 29 by 24 inches, and 24 inches just wasn’t wide enough. I added another 4 rows so it ended up being 16 x 20 flowers. This worked out much better. 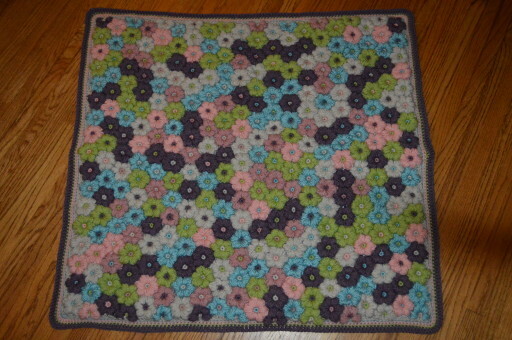 Once I added the border, the finished blanket was 32 x 32 inches, give or take. Also along the one side, the edge wasn’t straight enough to add a border around it. I decided I needed to fill the gap with half flowers. I made the half flowers the same as the full flowers, but just added 4 petals instead of 6. I used one at the end of each row, so the rows are actually 16.5 flowers long. I joined the flowers into 16 and a half flower strips, then joined the strips together. I wanted to pick them at random, so I put all the finished flowers into a bag and pulled the next one out with my eyes shut. I did the same thing when it came to which strip to sew on next. It was hard to resist the urge to put a flower back when it was the 3rd one of the same color in a row, but I stuck to it. The pattern gives excellent instructions for joining the flowers and I followed it exactly. The only thing I would add is to make sure you are making the stitch to join the flowers in the center stitch of each petal. Sometimes it would seem to line up better to attach closer to the side of the flower, but it looked better when I always picked the center stitch. 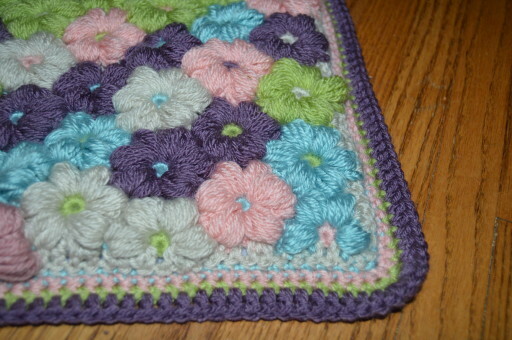 When I had the field of flowers all joined, I crocheted around the back side so I had an even edge to add the border to. 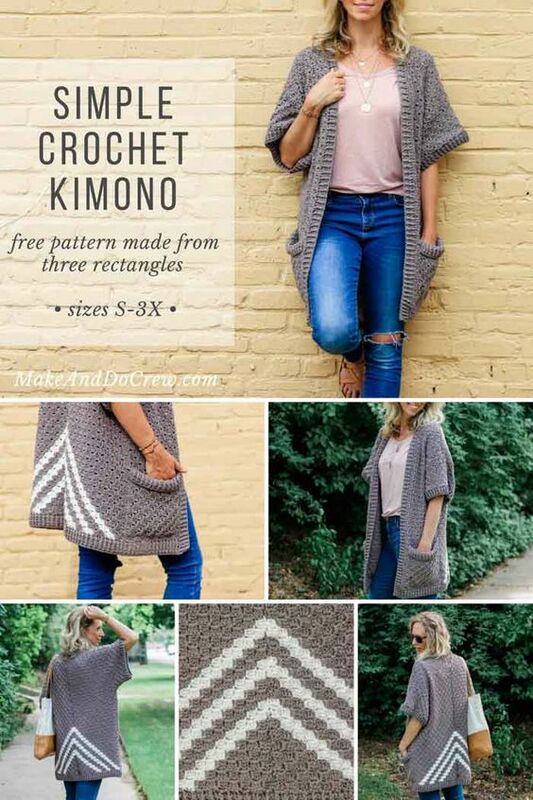 I double crocheted in the low spots and single crocheted in the higher spots. I realize that isn’t exactly a pattern, but I hope it makes sense. I just did what I needed to make an even row of crochet. For the border, I did several rounds of single crochet, one in each color, with a final round in purple to finish it off. It isn’t the most exciting border ever, but I think the simplicity works well with the busy pattern of flowers. 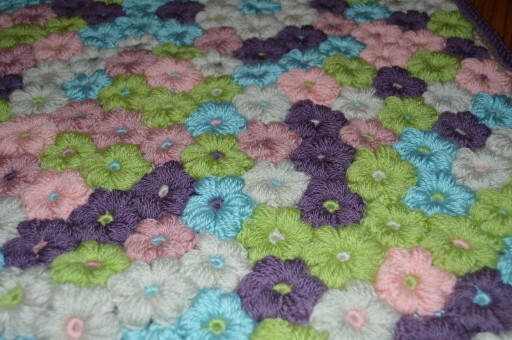 Right from the start, I knew I did not want to weave in ends on 330 crocheted flowers. I hate weaving in ends. So I didn’t bother. Instead I just covered them all up with a piece of flannel. This makes the blanket very warm and snuggly, and saved me a buttload of time. I bought a yard of baby flannel, hemmed the edges to the size of the blanket, then hand stitched it to the bank of the blanket. 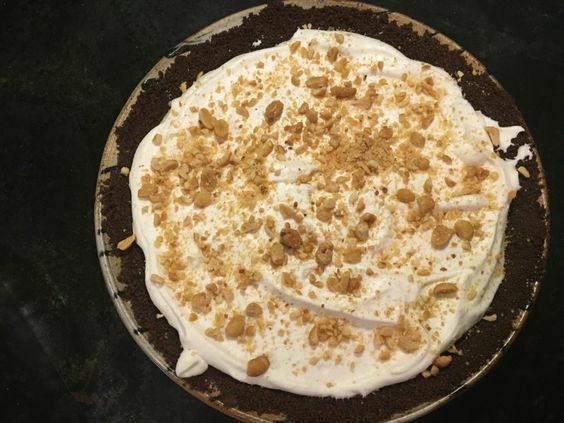 It isn’t perfectly even, but I don’t think the little one will notice. There are gaps between the flowers on the front and occasionally a rogue end will manage to work its way up. I’ve instructed my sister just to stick it back down where it belongs. So in the end, I love how the blanket turned out. It was more work that I originally anticipated, but to be honest, most my projects turn out that way. One caveat, this blanket is heavy. There is a whole lot of yarn in it. The flowers are super thick, and then I added a back to it. 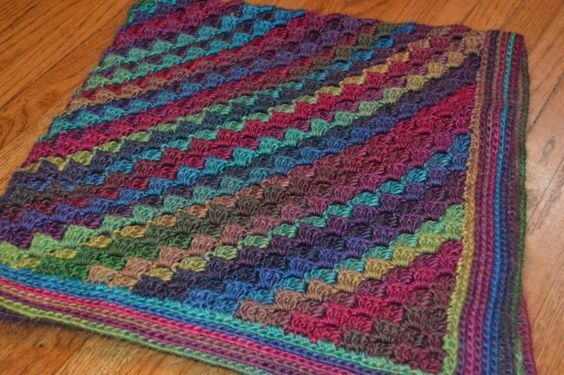 I think it will make an excellent tummy time blanket for the floor, or perhaps a cover for the car seat when outside, but I probably wouldn’t actually cover a baby with it until that baby is much older. And I apologize for the crummy picture quality. I wanted to bring the blanket with me for JuJuBea’s birth. I finished it time, but she decided to come a week early and I hadn’t taken any pictures yet. I got the call at 1 am and quickly took some pics before I headed to the hospital, but a combination of ugly flash my my grogginess led to less than perfect photos. Oh well, such is life. 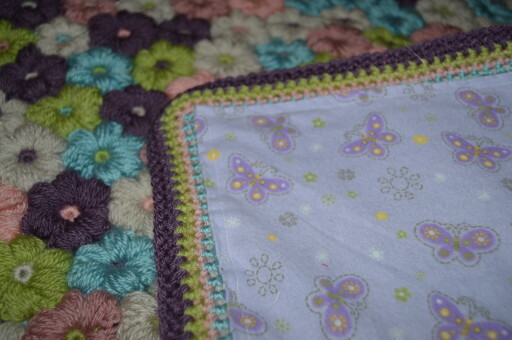 13 Responses to "Mollie Flower Baby Blanket"
I have made the flowers but don’t know how to sew them together. The 4th page of the pattern PDF gives instructions for joining. Is there a particular part that is giving you trouble? I joined the flowers into rows, then joined the rows together. 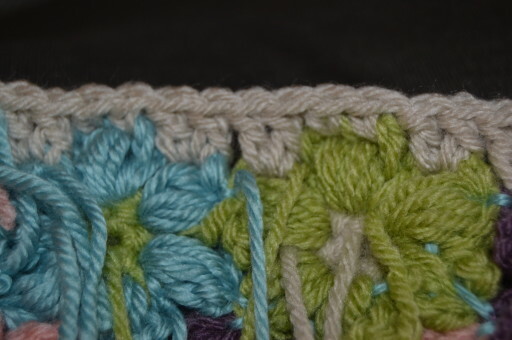 Basically you just run yarn through the wrong sides of the flowers and stitch the end two petals to the next flower. I used just under two skeins of each color, so I bought 10 skeins, but I had between 1/2 and 1/4 skein of each color left over. I hope that helps! Very nice. 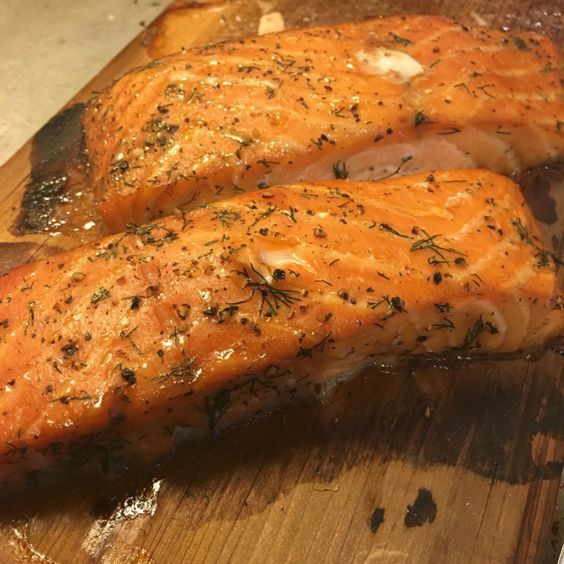 This is how I want to finish mine too. What size hook did you use? And what weight of yarn? Thanks! Worsted weight yarn and a G hook I believe. I usually prefer an I hook, but found the smaller hook made neater flowers. You are welcome! 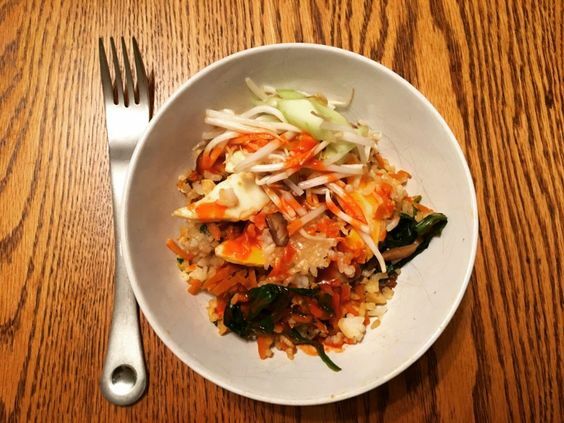 I am so happy the instructions helped! This is amazing. How big is this blanket? 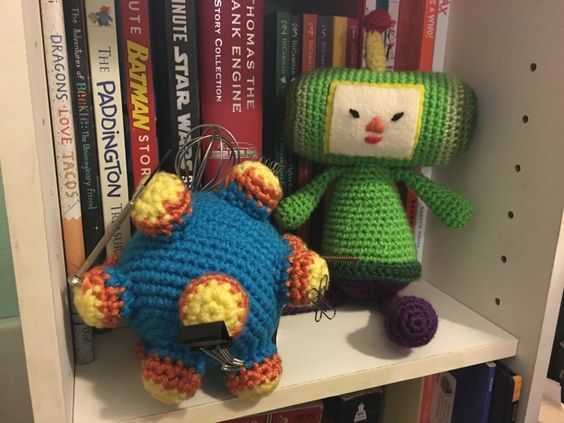 How did you crochet into the fabric? Thank you! The blanket is about 30 inches square if I remember correctly. I didn’t crochet into the fabric, I just used a needle and thread to sew it on. So you hand sewed it?